If you’ve recently thought to yourself, “I love peeling bananas, but I don’t actually like eating fruit or even taking in nutrients, for that matter.” – you’re in luck! 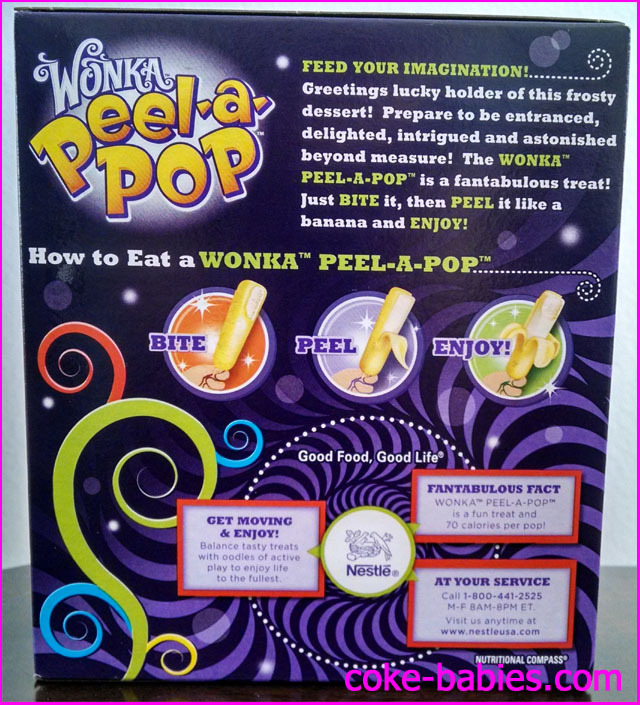 Presumably after their mind had been altered by a trip on the terrifying chocolate river ferry, someone over at Wonka came up with the Peel-a-Pop. This is an ice cream confection where you peel the “skin” off the ice cream, to get to the “fruit” within. Sure, why not? By the way, I apologize for using the term “ice cream confection” – it sounds too grown up. But it’s not an ice pop, or even a bar, so I didn’t know what else to do. 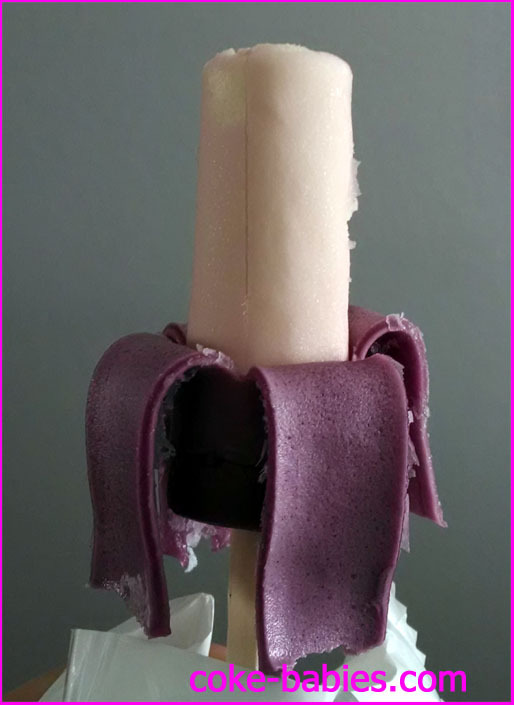 Unlike bananas, unless you are eating them incorrectly, with the Peel-a-Pops, you are expected to eat the peel. You probably won’t want to (more on that in a minute), but you can and are encouraged to do so. 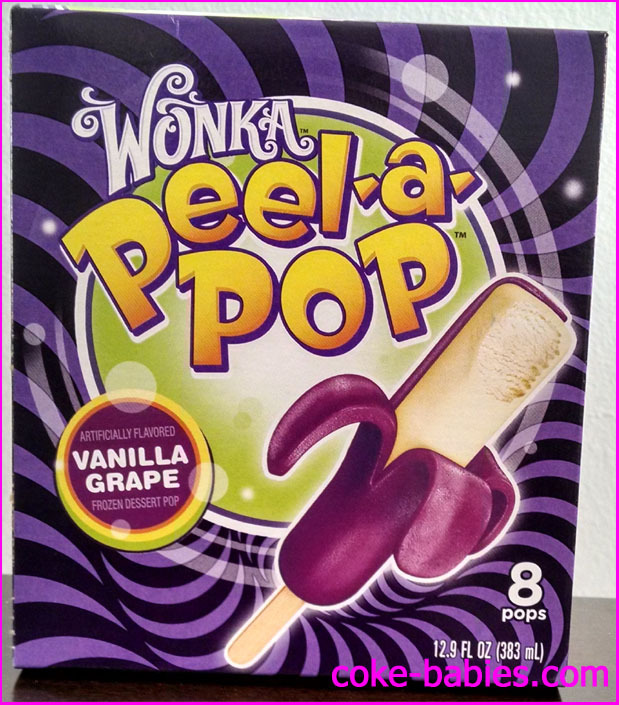 The Peel-a-Pops come in Vanilla Grape and Vanilla Banana. I didn’t buy the Vanilla Banana flavor because that sounded vile. But in case you require a review of both flavors, here is my review of Vanilla Banana: No. On the back of the box is where things take a bit of a turn. This is mostly due to some very creepy terminology being used. Wonka advises you to stay fit by balancing tasty treats with oodles of active play. First, “oodles” is an inherently unpleasant word. The only time it is acceptable to use that word is when you are referring to Oodles of Noodles. Otherwise, you sound like a pervert. Apologies for the atrocious quality but the show likes to take down everything of theirs from Youtube, so I had to make do with what was available. 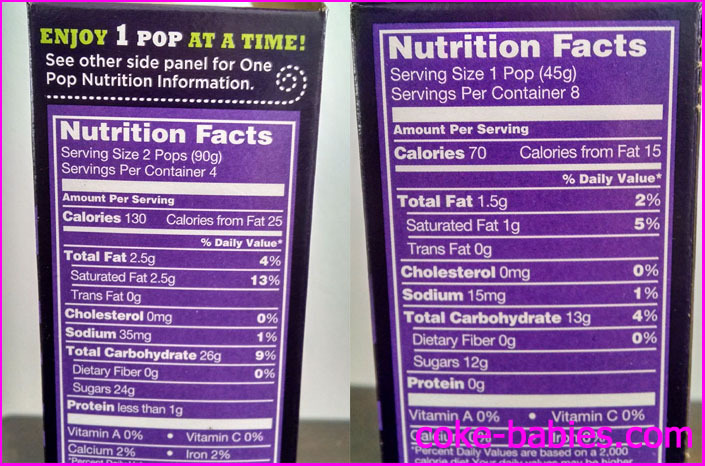 In case your interest is piqued by the “fantabulous fact” that the pops are 70 calories each, the box also rewards you with twice the nutritional facts. Apparently Wonka assumes that people who are enticed by foods that you can peel will not be good at math, so they felt the need to not only tell you the calories for two bars, but for one instead. The pop also reminds me of the exogorth (AKA space slug, for those of you who go outside) from Empire Strikes Back. After breaking out a ruler, since writing “about this big” while cupping my thumb and fingers into a rough estimation of size doesn’t translate well into text, the pop is about four inches tall. The peeling, while not effortless, works fairly well, and results in sort of a banana-looking thing. It’s at this point where much of the appeal (no pun intended) falls apart. I was expecting the peel to be sort of like Fruit By The Foot. It obviously needed some sort of chewy texture to peel like that, so I figured that made the most sense. Instead, it had the texture of what I assume that wax you peel of Babybel cheese would be like, if it was left outside to soften. And tasted about as good as that, as well. The peel is simply awful. The texture is horrifying, and it has a taste not unlike children’s cough medicine. 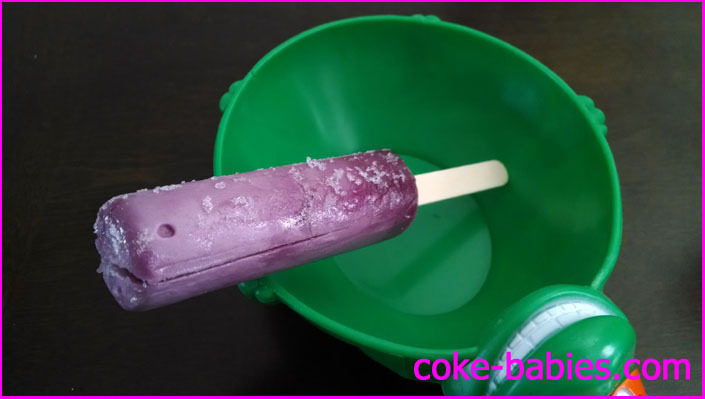 The ice cream itself is good – the vanilla flavor tastes similar to vanilla Jell-O Pudding Pops, with a very light hint of grape flavor sucked in from the peel through osmosis. But in the end, you realize that the only edible part of this pop is a few inches of vanilla ice cream, and decide that’s not a very exciting treat. 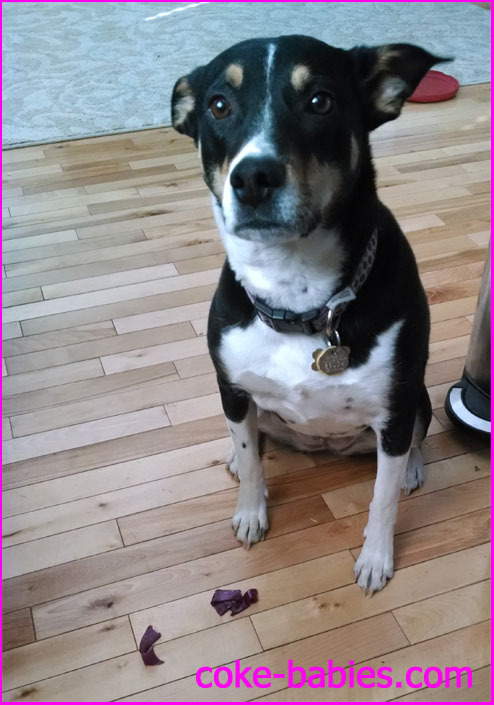 Don’t get me wrong – Wonka products are awesome… usually. This was just a miss for them. I appreciate the idea of adding a novelty factor for absolutely no other reason than adding a novelty factor. They knew it wouldn’t make the product taste better, and that it would just make it harder to eat. But they still made it just to have this strange product thrown out there, and I respect that. But when my dog, who literally eats feces out of my cat’s litter box if given the chance, refuses to eat the peel, it’s not a good sign. It’s possible that this was one of the products that Charlie green-lit after taking over, so maybe Willy isn’t at fault for this. 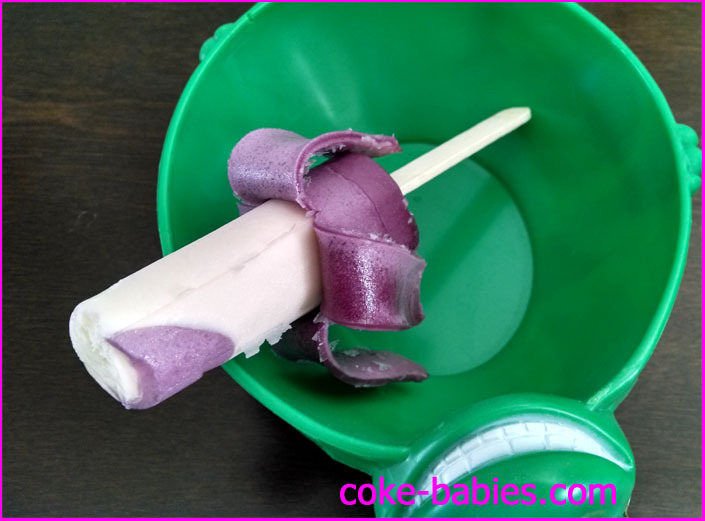 If the Peel-a-Pop was a song from the movie, it would be “Cheer Up Charlie” – not good, off-putting, has a weird grape flavor, and dogs don’t like it. Well, most of those attributes apply to both the Peel-a-Pop and the song, anyway.